← John Cage, b. 5 September,1912. 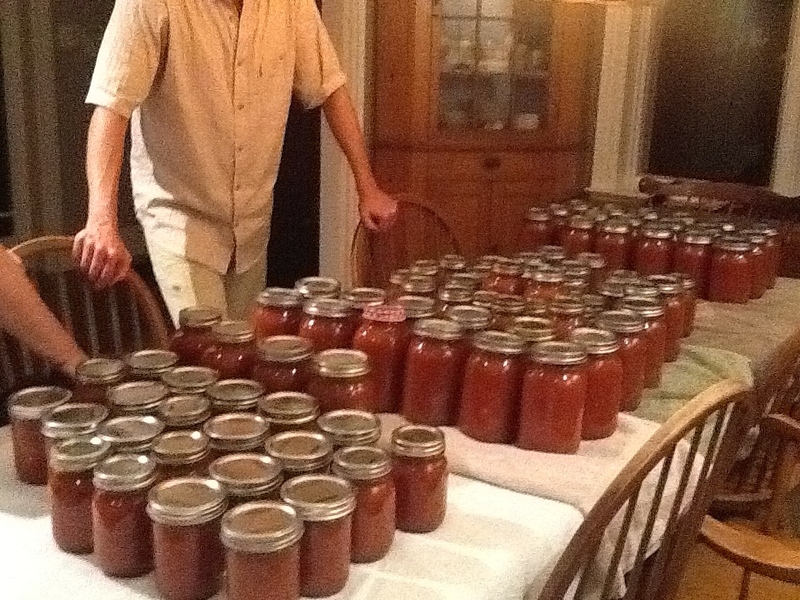 At the instigation of my project oriented son, our family gathered last summer to make tomato sauce.[1.] 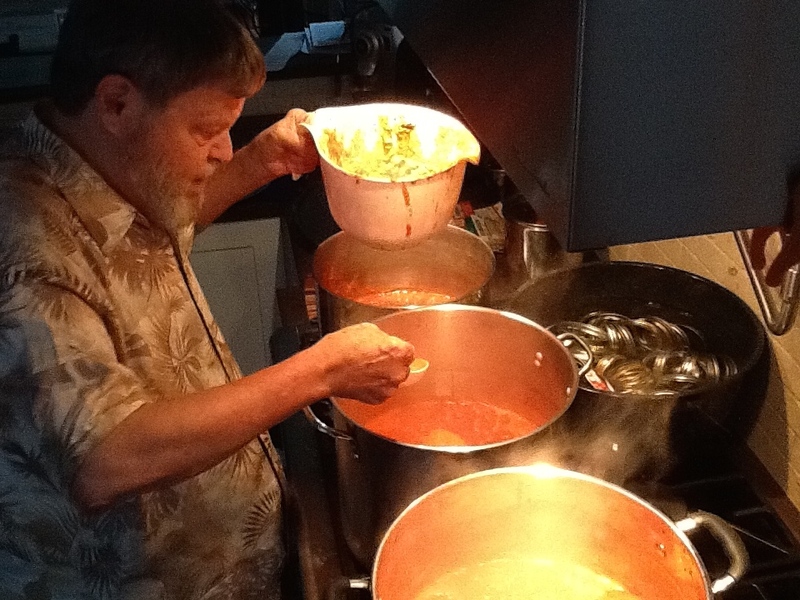 Assembly line sauce making was not new to us, but this time, given our production numbers, processing bushels of tomatoes with a machine too small, was particularly arduous. The tasks of blanching, skinning and quartering bushels of tomatoes, peeling sacks of onions and garlic, stirring and skimming froth over a hot stove and lifting sauce filled kettles for 16 hours, proved a bit strenuous for some members of our clan who next day suffered from post tomato stress. 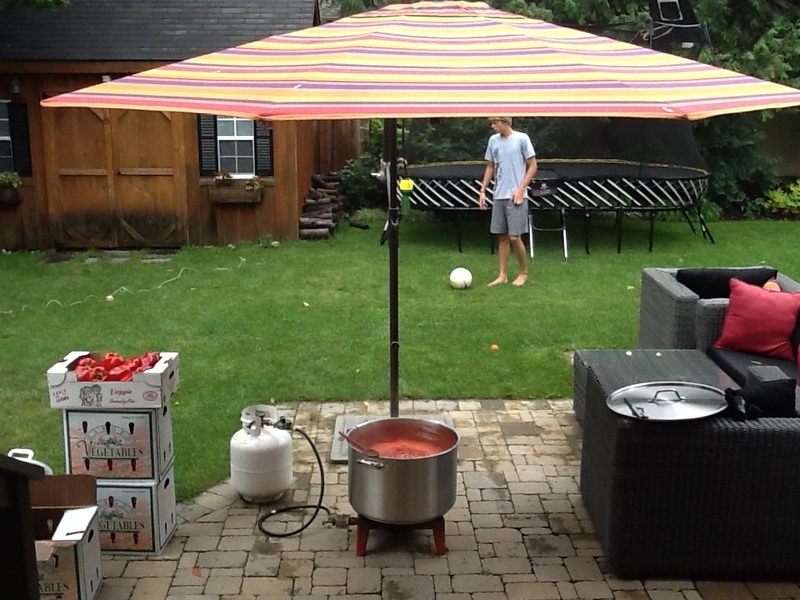 This summer, my son purchased a ‘real’ tomato processor. As fast as tomatoes could be inserted, It separated pulp from waste. No skinning, no quartering and the waste went to a neighbor’s compost. After the major work was finished, we convened a board meeting to discuss the events of the day and changes we’d make next summer. The meeting was accompanied by pizza and very good wines. Then too, it was one of those perfect Canadian evenings, blue skies, nary a breeze, and a shirtsleeve temperature one could barely feel, neither warm nor cool. The notes below were taken by our sauce secretary. Started at 6:00am -boiling water, Esme and Bryce started tomatoes by 7:30. Eleanor and Robin arrived at 10:00 – Dorothy and Jane at 11:30. Jane, a close family friend, left around 3pm; Dorothy around 5:30. This year Bryce bought the 1/2 hp tomato mill and it made a huge difference: each bushel took 30 minutes. We processed in 2 batches. We did three bushels and stopped then did all the ingredients for both batches then started processing the rest of the tomatoes at 5:00pm. started canning the last batch by 8:30p. First batch was finished by 4:30. 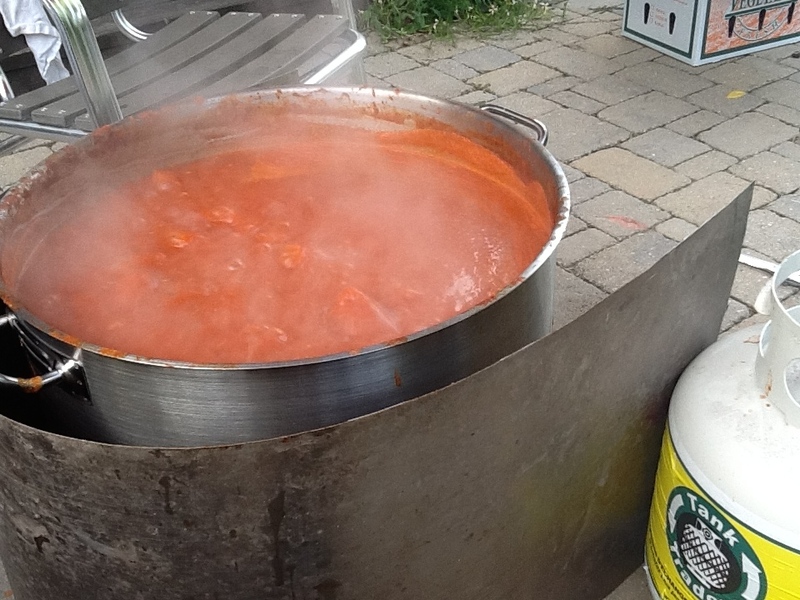 The first, using 3 bushels of tomatoes was canned by 5:30. We made burgers from Bruno’s with buns from Cobbs; crudites and tortilla chips and it was a great break around 2:00. Earlier would be better. 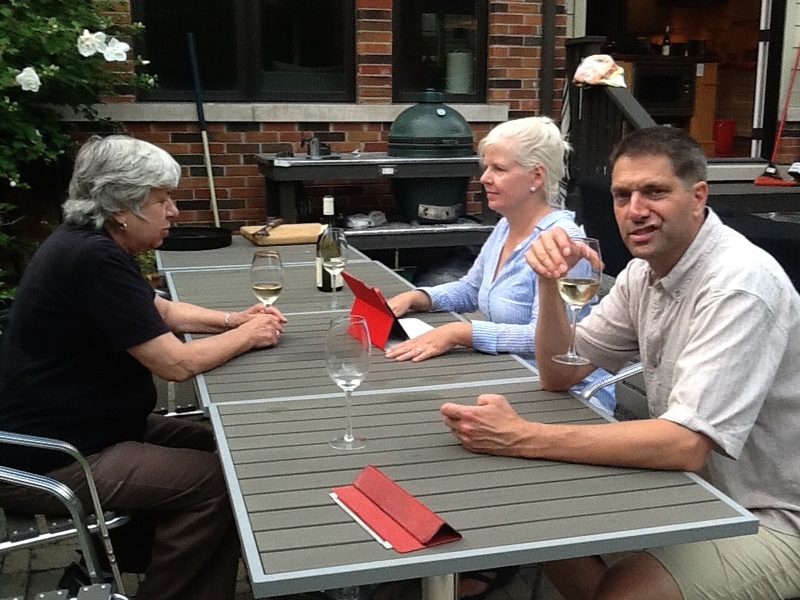 Jane brought a fabulous red wine that we had with Pizzaiola Pizza in the back yard: Chateau La Fleur Jonquet 2009. Buy a stirring paddle for the big pot. Buy another burner and pot. with the new tomato press. 6 bushels was the right amount; in 2013 we had 3 batches. San Marzano tomatoes were pulpier and we should get those again. Make sure there are lots of lids. Walmart had them. Small is 70mm; wide is 86mm. Don’t buy 76mm! [2.] 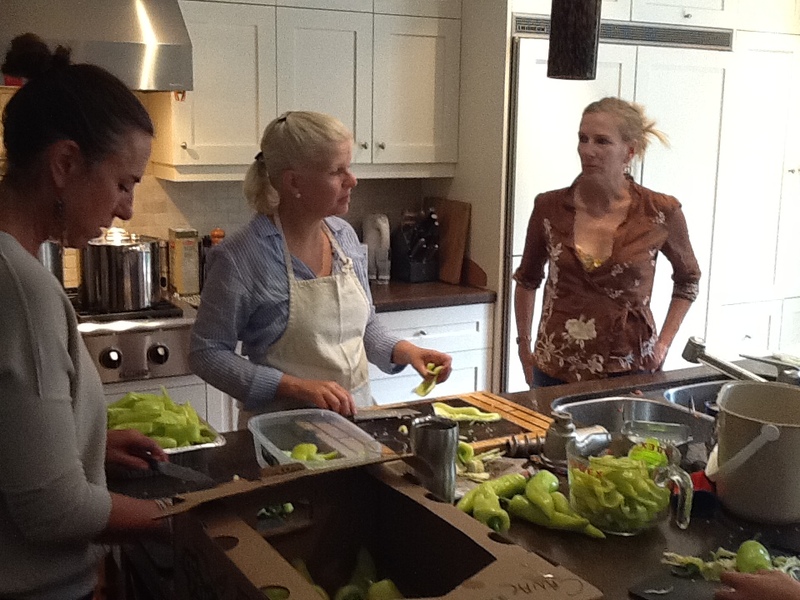 The tomatoes and vegetables were from Holland Marsh, about 31 miles north of Toronto. Years ago the land was a vast bog. Over time, Dutch settlers drained the marsh,eventually exposing 21,000 acres of fertile black soil, perfect for planting root crops. Holland Marsh, or the Marsh as it is referred to, is the bread basket of Ontario. [3.] I have become interested in non-shedding, hypo allergenic puppies. As a condo dweller, I’m interested in non-pooping, non-peeing, non-barking puppies that are fed by breathing and require no exercise. Part of our 88 quart production for the day. Meeting of the Board with the Green Egg in background.